Sadly, season 2 of Refashion Runway has come to a close. It was an exciting competition, full of inspiring creations from everyone! All the ladies did such a fabulous job, and it was hard to say "see you later" to someone else every week (well, except last week when Beth graced us with a Halloween miracle!). I feel so honored to have been able to take part and pleased as punch to have placed 3rd overall. Thank you, thank you, thank you! The past six weeks have been a little stressful at times, and yet I feel like I have accomplished so much in that short span. I have pushed myself to learn and try new things. I've been inspired by the other contestants' and readers' refashions. I've had some late nights putting the finishing touches on my projects to make the deadline. It's been such a blast, and I wouldn't trade the experience for anything. In case you missed any of them, you can check out the details for any of my entries - and see what I was up against each week - via the links below. 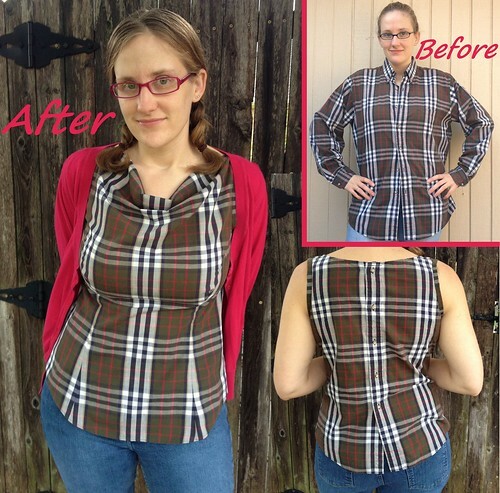 I took one of my husbands seldom-if-ever-worn shirts and turned it into a drapey-front, button-back top for me! Click the pic for my post about it, or go here to see everyone's projects for that week. 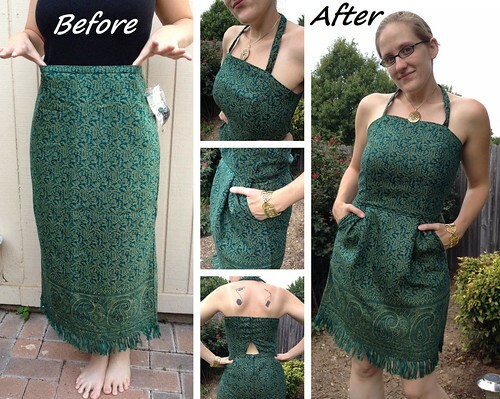 I used a frumpy emerald green skirt with a gold brocade design to create a tulip dress with pockets and a peek-a-boo back. Click the pic for my post, or click here for the weekly recap. 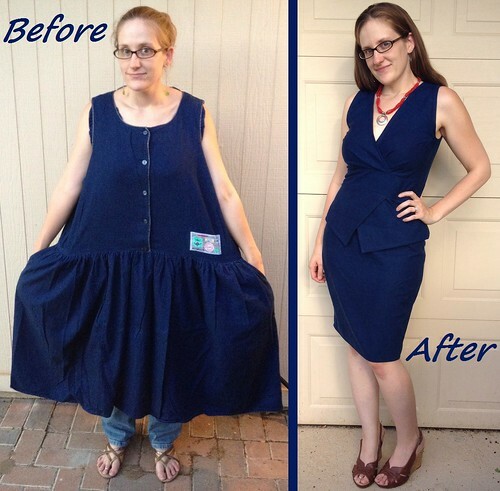 I drafted my own pattern to turn this huge handmade denim dress into a not-so-huge handmade denim dress. Click the pic or go here. I combined a too-small suede skirt and a too-large tee into a waterfall jacket. 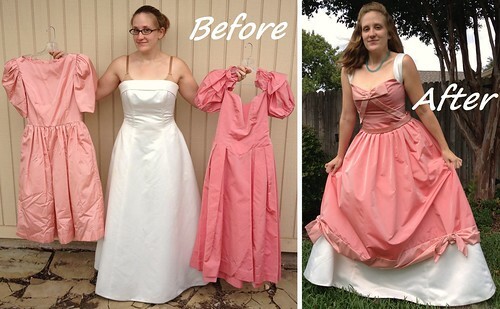 Using freecycled formal wear, I created Cinderella's original ball gown. 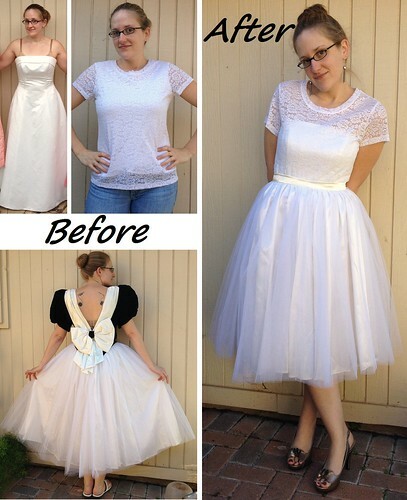 A prom dress, lace tee, and the top portion of the wedding dress above went into making this holiday party dress, whose three pieces can be work together or individually for lots of different looks. Thanks for following along and casting your vote every week, even if it wasn't for me! I am more inspired than ever to keep at it, so stop back by soon and see what else I've got up my refashioned sleeve! The expectation of what would be the next challenge was as much fun as viewing the results. I knew that you would do well ! Don't stop pushing yourself now that the pressure is off for we have seen your spectacular creations and that has heightened our expecations of what you can do next. Good Going, Girl! Thank you, Nay! I was singing that song for a week solid whilst making the costume too! You did a great job all through the competition! I really enjoyed every single one of your refashions. Inspiring! Thanks, Magda! Your refashions were fantastic too, as usual! Sometimes I wish I had a little one, just so I could sew adorable stuff for her! Congratulations on a great season! I've been a fan of yours the entire way. I've also been inspired by your creativity and I look forward to following your blog for more! Well done, you should feel proud! Thanks, Ingrid! I do hope you stick around! Congratulations, Carissa on a fantastic season! Each week you brought to the competition such creativity. I was always impressed by your quality of handiwork. 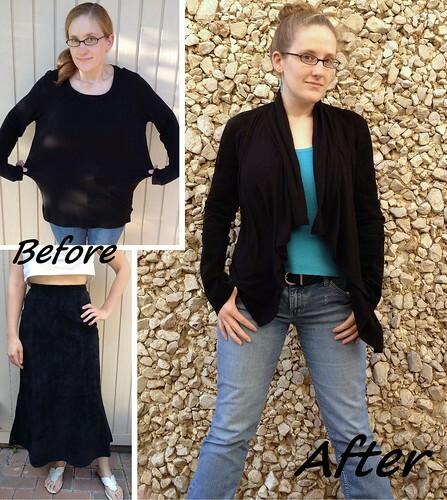 And, doing extra projects along the way...you are a refashioning machine! Great job. I look forward to seeing what you come up with next! No, congratulations to you, Susan! It was clear week after week that you are a very skilled seamstress. You deserve it! Congratulations, Carissa! You did a fabulous job every week. I loved the way you approached each challenge and your end results, very well done and original. :) It was great getting to 'meet' you! I look forward to following you and continuing to be inspired by your work. Thank you, Desarae! You, too, amazed me. I still can't believe what you accomplished at such an early stage in your sewing career. Never lose that courage and creativity! You never cease to amaze me with new heights in awesomosity. Will do, though something tells me you have more sway in that department than I. You are a wizard with a sewing machine! Thanks, Jenny! I'm glad you found me too!